Following two weeks of marathon negotiations, world governments today adopted a suite of groundbreaking decisions on regulating legal, sustainable and traceable trade in wildlife. This included strengthened actions to combat illicit wildlife trafficking, higher protection to entire groups of species, targeted demand reduction strategies for illegally traded wildlife, and agreement on closer engagement with rural communities. “The most critical meeting in the 43-year history of CITES has delivered for the world’s wildlife. #CoP17 is a game changer for the planet’s most vulnerable wild animals and plants,” said John E. Scanlon, Secretary-General of CITES. The CITES #CoP17 was the largest ever meeting of its kind with 152 governments taking decisions on 62 species-listing proposals submitted by 64 countries. In total, over 3,500 people attended the meeting, which also recorded the highest number of side events and intense media interest from every region of the world. The Johannesburg meeting ended a day early, with high levels of consensus and a focus on implementing decisions on the ground. The outgoing Standing Committee Chair, Øystein Størkersen described CITES as an exceptional model for how to give expression to international agreements. John E. Scanlon, CITES Secretary-General said: “#CoP17 adopted decisions that saw wildlife firmly embedded in the agendas of global enforcement, development and financing agencies that have the capacity and technical expertise to help ensure implementation of the Convention on the front lines, where it matters most – with the CITES management and scientific authorities, as well as customs officials, rural communities, businesses, police, prosecutors and park rangers. Multiple new animals and plants were also added to CITES Appendices for the first time, and hence will come under CITES trade controls. These decisions affect a large number of mammals, marine and timber species as well as many reptiles and amphibians and include more than 350 species of rosewood, devil rays, silky sharks and thresher sharks. “CITES is now seen as an indispensible tool for achieving the Agenda 2030 and Sustainable Development Goals,” observed Scanlon who also thanked South Africa’s Minister of Environmental Affairs, Dr Edna Molewa for hosting the Ministerial meeting on the topic of CITES and the Sustainable Development Goals. Decisions on rural communities engagement, providing a greater voice for local people in managing wildlife. It was also the first meeting where the European Union was participating, and voting, as a Party to the Convention. Changes to the CITES Appendices, Resolutions and Decisions enter into force 90 days after the CoP. “It was here in Johannesburg that rural community voices and the voice of the world’s youth came into the heart of the meeting room to be heard by decision makers from across the world. It has been a truly wonderful CoP from every perspective for which we extend our deepest gratitude to the Government and the people of South Africa,” concluded Scanlon. The 17th Meeting of the Conference of the Parties to the Convention was held from 24 September to 4 October 2016. It was attended by over 2,500 participants from governments and numerous observer organizations. COP18 will be held in 2019 in Sri Lanka. All the results on the 62 proposals are available on the CITES website. 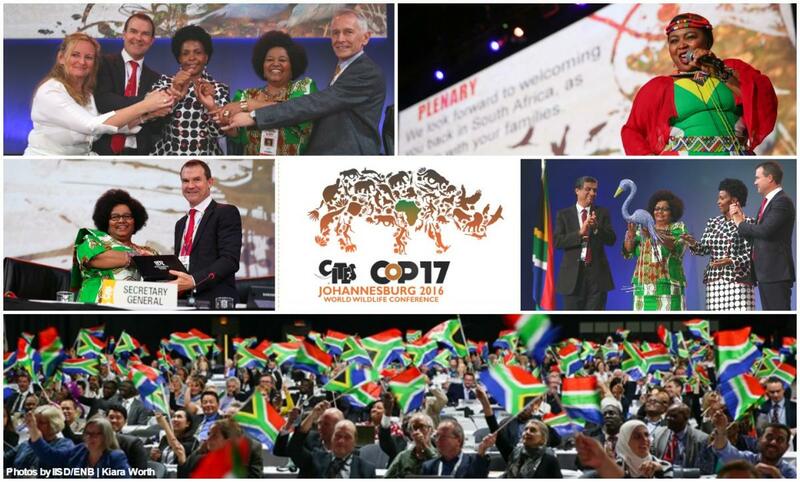 100 days left before the World Wildlife Conference – CITES #CoP17 – kicks off in South Africa!